Listed below is a list of Frequently Asked Questions. These only cover the basics and if there are any questions you have or topics you would like to discuss, do not hesitate to call on us. Some of the questions below also have a video response. Click on the to watch the video presented by Andrew. How to Choose the Right Yacht Charter Broker. How to Book a Private Yacht Charter. What is my first decision when planning a private yacht charter? Your first decision when considering a private yacht charter is making sure you have the right professional yacht charter broker. Most guests are very smart and successful, but we all need guidance in areas where we have little or no experience and having the background we do trump all our competitors. This answer to question # 1 is tooting our own horn, but guests need to know who they are working with, and this is who we are 23 years later. 1) Select the Right Broker. I have been a captain on my own Caribbean catamaran charter yacht for 5 years (1990-95). Knowing the location you are about to enjoy is paramount to impacting your "ENTIRE" charter yacht vacation. 2) I make myself available to all my clients by being available 24-7 -365. I am the only person my guests will get at 2 am, 3 am and 4 am when emergencies occur. Almost all other companies close their doors Saturday, Sundays and public holidays, Call 954-720-0475 on any of these days, and our office for the past 18 years has answered immediately. 3) Telephone: A rule at our company is to answer the telephone; not one message may be left on the voice machine. What the telephone guests will hear is a person talking with them on the other side. Your call really is important to us; we do not just say it. 4) Ideas: We provide fresh ideas, such as "which is the best week of each month and which is the best one week of the entire year", and explain why. If guests want "The Ultimate" yacht charter rental, then these are fine points to consider. 5) Our company is one of very few yacht charter brokers who travel to Genoa, Monaco, Greece, Antigua, Tortola and the USVI "every" year to inspect the charter yachts during their annual boat shows. The idea is to meet the crew and inspect the yachts we board. Knowing our product, the private yacht and her crew provide you with knowledge to make informed decisions. Knowing about all the locations where you are to go is vital to making your experience that much better. 6) When we first started in the industry, we started taking pictures of all the internal cabins, salons and kitchens, as well as the crew on board all the yachts we board; so all the pictures you see on our company website were taken by me personally. Today, 23 years later, no other company takes their own pictures of all the various yachts around the world. With BHC, what you see is what you get. As Confucius say 'One picture is worth a thousand words". 7) Our professional staff has a wonderful record; the last person hired to work here has been with us for 9 years, the rest for much longer. 8) Our service to all our guests is free. We are paid by the yacht owner, so we are not biased, and this helps us to select the best vessel and crew team for you. 9) Your funds are kept in escrow, so if there is an issue (very rare) from their side, we are in a position to refund your monies. 10) The Florida Yacht Brokers association (F.Y.B.A.) is the largest association in the entire state of Florida, and we have been members for many years, as well as BBB, the Better Business Bureau. 11) Our company is not here to save guests $1,000 or $500, so reading all those little special savings many owners offer guests to pay for their particular charter yacht can be a nightmare for the guests. Our major role is to make sure our guests enjoy the very best value for their dollar; arriving home irritated, angry or sad is not what we do. How difficult is it to irritate guests who arrive on vacation smiling with great expectations? Well, some crews manage to do this far too often. The better captains simply do not need to drop their rates. They do their jobs correctly and are always well booked. We know how to save our guests money, so simply ask, and that would be done if it were possible. If there is a $1,000 saving, I will know if it is a good saving or just an owner trying to entice business for his weak team. 12) If the captain/owner does not provide what guests contracted for, it is Barrington-Hall who stands up to fight to get this rectified. Keep in mind that all the owners in the charter industry want our future business. What better position to be in? Without a professional broker to represent you when there is a problem, guess who loses?. Let us assist you and you will have a great private yacht charter vacation. Fully Crewed Yacht charters vs. Captain Only charters. Fully crewed yacht charters means there is at least a captain and a chef on board to cater to your every request. The major reason for a crewed yacht charter is for the women of our families to enjoy the entire vacation period as well, away from planning meals, serving meals and putting dishes away after every meal. The ladies are on vacation too and deserve to relax on their vacations. The men can spend their time bonding with their children and their wives. The fully crewed yachts have couples that know the locations exceptionally well and can share with you the history of various islands, no matter where you are in the world. How to do things and where to go is what these crews know best. Different anchorages for different reasons are why your broker shares his knowledge with you. No matter how large your crew, there is always someone on hand to share the local and island knowledge/history with you. Large luxury crewed motor yachts based in the French & Italian Rivieras share with guests where the best places are to enjoy meals, where the better casinos are and where the best beaches are. Today, the luxury modern catamaran and the high-end luxury power yacht offer guests a real resort on the water moving from island to island. To enjoy your "ULTIMATE VACATION", it needs to be fully crewed, and that is exactly what we specialize in. Yes, the initial price saving is $2,000 or maybe $3,000, but what do you have to do to save that money? You have to feed the captain and everyone on board; all food costs, as well as any other expenses, are for you to pay. This means there is no chef on board, so the guests need to do all provisioning, cooking, cleaning dishes and storing them away, which means their relaxing time is impacted by working hard again. What are Bareboat yacht charters? Bareboat yacht charter rentals are for the race car drivers of our industry, the men who know exactly how to sail a yacht. They know what to do and where to go, so only the yacht is rented. The price would be less than a captain only yacht charter, but all food, bar, insurance and all other related costs are to be paid for by the guests. At the end of the day, the cost for a bareboat is normally only a $2,000 saving, and that $2,000 can be a nightmare. Barrington-Hall specializes in fully crewed yacht charters and has done so for many years now. Power or motor yachts are powered by their inboard motors. Their fuel expenses are normally a big issue to deal with, plus guests get to their destination faster, but not much faster, as most power boats travel at speeds of 10-15 knots maximum. Catamarans and monohulls travel at 4-10 knots maximum, but sailing vessels tack to reach their goals, so the sailing is quiet and takes longer. Modern catamarans and sailing boats use the gentle wind as power, so very little fuel is consumed. All charter boats in the Mediterranean and all vessels between 90-500 feet in the rest of the world use pricing models as follows. The owners give us a base rate. Euro 50,000 to rent their yacht. Added to this is the A.P.A. (Advanced Provisioning Amount) estimated at 35% of the base rate. This APA takes care of "ALL" expenses, and 90% of all clients do enjoy change from the APA amount. Tax (VAT) is also paid in various amounts, depending where in the world you are going to charter. 50,000 + 17,500 + 3,250 = Euro 70,750 for a Greek luxury power yacht charter. Today, the luxury modern catamaran can cost between $25,000 and $50,000 to charter for 10 guests all-inclusive for a one week charter. Your Ultimate Vacation can cost between $2,100 to $3,300 per person per week "All-Inclusive." And this most of us can afford. Where to go, what to do - ask Andrew. Barrington Hall Private Yacht Charters is in the service business by providing our clients with in-depth and personal knowledge of luxury yacht charters and charter destinations. Why Choose Barrington Hall Yacht Charters as Your Yacht Agent. I know my stuff: I was a captain on my own Caribbean catamaran charter yacht for 5 years (1990-95). Knowing about the location you are about to enjoy is paramount to impacting your "ENTIRE" charter yacht vacation. 24/7 Available: We make ourselves available to all clients by being available 24-7 -365. We are the only people my guests are likely to reach at 2 am, 3 am and 4 am when emergencies occur. Almost all other companies close their doors on Friday night at 5:00 then you are on your own. Saturday, Sundays and public holidays, Call 954-720-0475 on any of these days, and our office for the past 18 years has answered immediately. Telephone access: A rule at our company is to have the phone answered by a live person; not one message may be left on the voice machine. What the telephone guests will hear is a person talking with them on the other side. Ideas: We provide fresh ideas, such as "which is the best week of each month and which is the best one week of the entire year", and explain why? If guests want "The Ultimate" yacht charter rental, then these are fine points to consider. Travel to Shows: Our company is one of very few yacht charter brokers who travel to Genoa, Monaco, Greece, Antigua, Tortola and the USVI "every" year to inspect the charter yachts during their annual boat shows. The idea is to meet the crew and inspect the yachts we board. Knowing our product, the yacht and her crew provide you with knowledge to make superior decisions. Knowing all the locations where you are about to go is vital to making your experience that much better. Personal Photos: When we first started in the industry, we started taking pictures of all the internal cabins, salons and kitchens, as well as the crew on board all the yachts we board; so all the pictures you see on our company website were taken by me personally. Today, 23 years later, no other company takes their own pictures of all the various yachts around the world. With BHC, what you see is what you get. What to bring with us? 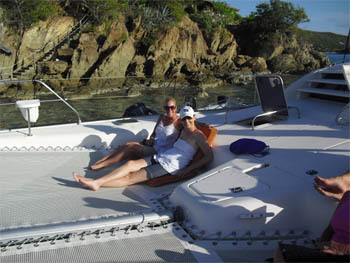 Catamaran sailing vacations are generally informal and laid back so bring your comfortable clothes. Include several swim suits, T-shirts, shorts and beach cover-ups as they are the order of the day. If you are planning to visit some of the onshore restaurants or bars then cotton shirts and shorts fine for most establishments. However, some of the more exclusive restaurants will require business casual attire and long pants for men. It’s also a good idea to bring a few light tee-shirts to wear during snorkeling and other water activities to help prevent sunburn. The midday sun in the tropics can be intense so it is highly recommended that you bring hats to wear in the afternoons. What kind of footwear do we bring? The wearing of shoes on board is not necessary (barefoot in paradise, right?) as the decks stay cool, and the surfaces have are non-slip. If you are uncomfortable being barefoot, you can bring white-soled shoes or any type of deck shoes, but dark soled or hard soled shoes and high heels will damage the boat and are not permitted. For ashore excursions wear beach shoes, flip flops, sandals and sneakers for any hiking. Soft and flexible bags work best as they can be easily packed out of your way once you have settled into your cabin. Bring extra totes to use for carrying back all those items you bought during any ‘retail therapy’. Do we need to bring any snorkeling equipment? Most catamaran charter vessels are well equipped with selections of masks, fins and snorkels and will fit most users. If you have your own, we’d recommend you bring it especially a well fitting mask. Young children can benefit from having a better fitting mask so they comfortable as they are learning to enjoy the delights of the underwater paradise. Your catamaran sailboat or motor yacht will have all bed linens, bath and hand towels, beach towels and face cloths. During your week on board there will be a mid-week linen change. Guest showers are supplied with bottles of shampoo and liquid soaps. You are welcome to bring your own if you prefer. Yes, please bring sunscreen. Lots of it. Bring whatever kind works best for you. The tropical sun is very strong even in the winter months and can be deceiving. Spray sunscreen gets everywhere and can cause slippery conditions, so bottles are the best way to go. Apply liberally and frequently especially the fair skinned! Make sure you bring a good supply with you. Although, there are pharmacies on the main islands they are usually not well stocked. Yes. Passports are required to enter most of the charter destinations. Also passport ID is now required to re-enter the USA, as part of a "Western Hemisphere Travel Initiative" that the US is implementing for border security. As a precaution it’s a good idea to check to make sure it is required and that it is valid during the duration of your yacht charter sailing vacation. It is your broker's responsibility to ensure that seasickness never happens. Since 1990, I have had this question asked of me many times and never had one client say they were seasick during their vacation. It is my position not to subject my clients to any open ocean crossings. This is why island hopping is so much fun. Your pick-up point sets the scene for your Caribbean yacht charter. As a captain, I would have the guests fly into and out of Beef Island, Tortola, British Virgin Islands. As soon as the guests land at the airport, I assist them with their luggage and walk them to the dock to board their vessel. Once on board, I cruise around to Marina Cay, which takes 3 minutes over calm protected water, and remain there for the first night. Water sports, snorkeling, a restaurant on the white beach and super protected anchorage means the next day guests come to me and say, "Andrew, you can take me anywhere in the world, this is perfect." Subconsciously, that motion sickness has been broken. Guests realize that the water is very calm, and they can also see all the different islands around them. But the captain has to be aware of this delicate balance he must keep during the entire trip. Bring Dramamine, wrist bands and ear patches, but do not take the Dramamine, yet; you are possibly not going to need it. Wearing the wrist bands and ear patches is fine. When guests can see all the islands around them all the time, it is a subconscious positive point. Subconsciously, this says "I can get off within 10 minutes". Sailing or cruising for 1 hour means guests are on dry land or snorkeling until lunch time, then enjoying lunch. One more hour is needed to get to their next island "IF" they wish to travel another hour or so. These island hopping Caribbean or Bahamas yacht charters on board your own private yacht can be the very best adventure of your life. If one person in your party feels they may have motion sickness, then just make sure your broker knows about this immediately. I will instruct the captain on what is to be done and make sure this delicate point is taken care of -There is absolutely no reason to get seasick on any Barrington Hall sailing trips or cruises. FYI: Your BVI sailing vacation or cruising destination is the world's number one protected cruising ground. Guests can do 2 or 3 Virgin Island charters before trying new sailing locations. Second to the British Virgin Islands is The Grenadines. St. Martin and surrounding islands have a few good months to be on charter there, but the wrong months will wreck your one week motor yacht cruising vacation. The Mediterranean has a few months to do a private yacht charter, so keep within May, June, July, August and September when planning. My favorite crewed charter yacht location in the Mediterranean is Greece, then the French and Italian Rivieras, the playground of celebrities. The Bahamas have 700 islands to explore and different directions to consider. Always consult your yacht charter broker for answers, and make sure he or she has the background needed to correctly answer your questions. As a guide, I suggest guests start with the BVI, and do 2 or 3 one week yacht charters in this location, then do the Grenadines; after the Grenadines, go to Greece. After Greece, go to St. Martin during the correct months, and then do the French and Italian Rivieras. Never do the Mediterranean before doing the British Virgin Islands. These wonderful island hopping experiences are like learning to walk -- first you crawl, then you walk, and then you can run. A smart yacht charter broker will never subject his/her guests to any open ocean crossings. The biggest mistake guests make is that they look at different islands and feel they can do many more than they can, because traveling time is never considered at the speed the normal power boat or catamaran takes to get to each island. Private motor yachts travel between 10-15 miles per hour, very slow; catamarans and sailing yachts travel at 4-10 miles per hour, and they do not travel as the crow flies; they tack with the wind, so their distance is longer. The ideal distance for catamaran sailing vacations to travel in one week is between 70 and 150 miles, so that our guests enjoy the right amount of relaxation and traveling in their important charter period. Luxury power boats can do between 80 and 220 miles in one week. Yes, distance can be extended, but talk with your yacht charter broker. A private motor yacht charter vacation is one of the most adventure filled, yet relaxing vacation you will have in your lifetime. We are ready to guide you in undertaking this wonderful vacation. Not sure where you want to go or you are not familiar with the best charter locations, then call us on 800-478-2029 / (954) 720-0475 or email us with all your questions. Will my children be bored? Never! They will probably have more fun than you will. Endless days of swimming, fishing, kayaking, snorkeling, tubing, wake-boarding, knee boarding, water skiing, treasure hunting, building sandcastles and exploring uninhabited islands. Most boats have TVs and DVDS, but you will be pleasantly surprised to see how little they are used. Are there Internet access and telephone services aboard? Yes. Wi-fi routers are normally on all yacht charters. Can special dietary arrangements be made for us? Absolutely. A few weeks before your charter vacation you will be sent a food and bar preference questionnaire with a sample menu for you to complete. This is where you let the captain and crew know about any special dietary needs and special food requests. Is there fresh water to safely drink? Definitely. Most boats’ water is taken on while still at a dock and is filtered as it goes into the tanks. It is double filtered again on board before ever reaching the faucets. Most water is made on board with reverse osmosis water makers producing extremely pure water. Even this water is double filtered again before it ever gets to you. Is there air conditioning on board? Yes. 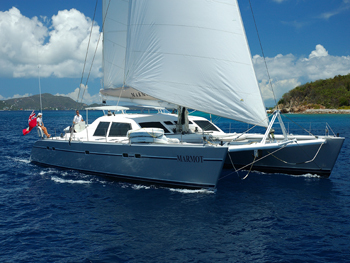 Most catamaran sailboats have full air-conditioning in the cabin and common areas. The cabins are individually controlled by the guests. Most staterooms are equipped with fans and have hatches that face forward catching the sea breezes. Normally, while at anchor these boats always face the breeze letting in the fresh air. Is smoking allowed on yacht charters? Smoking is not usually allowed anywhere inside the boat as it can very easily create a fire hazard to others and the boat. Smoking is usually acceptable outside on deck. All the boats have an "absolutely zero tolerance" policy regarding illegal drugs. If you are found to be in possession of an illegal substance, the charter will be terminated immediately, without notice and with no refund. It is important to understand that if illegal drugs are found on board by authorities that the boat can be seized while you, your party and the crew can be subject to arrest and persecution. Additionally, the captain and crew can lose their licenses and livelihood. Do I need any sailing experience to enjoy a catamaran charter? Absolutely not! You can enjoy any catamaran sailing vacation without any sailing experience at all. Guests are not expected to participate in any crewing activities on the boat and unless you choose to and/or are interested in learning about sailing as you are the star on the boat and everything is done for you. Most crews enjoy guest participation and will take the time to explain sailing techniques, demonstrate how the on board apparatus works and will happily provide a hands-on experience to anyone who is interested. Can I create my own itineraries? Our company is one of very few who provide our guests with pictures of where they wish to go, because we took all these pictures. May I respectfully suggest to look at your itinerary well after you have selected your crew and your yacht, sure you already know the location you are about to enjoy, but keep your mind clear for the selection of your yacht. Some locations like the Virgin Islands are so diverse, that there is something for everyone. It is your vacation and we want you to go, do and see what you want to see – when you want to do it! Most yacht charter captains build an itinerary around your interests and activities. When you first arrive on board you will finalize the itinerary. Flexibility is one of the great benefits of being on a charter which allows you to modify the itinerary. It is customary that each morning, over breakfast that the day's plans are reviewed and can be changed as you want. Also, just in case the weather has decided not to cooperate, we can make alternative for the days activities. British Virgin Islands Yacht Charters: Where dolphins and mermaids play! Grenadines Yacht Charters: Spice island Seduction. The Spice Islands towering out of the water to lofty heights piercing the clouds with their peaks. Bahamas Yacht Charters Route Exumas: Bahamas where long tail tropical terns fly to have their young. Quote by Henry Miller: Marvelous things happen to one in Greece - marvelous good things." The French/Italian Riviera: Where the rich and famous play, night and day. Trip insurance is just such a safe thing to do for all my clients. I work with one Insurance company, because in 23 years they had to pay 2 different parties and my clients were paid immediately. Depending on age and cost of your charter, rates vary between 150 per person and $300 per person. Here is what 99% of all guests forget about trip insurance. Let’s say you pay 1 year in advance, well you are covered for this entire year as well as the week they are on board. I have found that children breaking an arm, or someone having a car accident, or an elderly family member getting sick before your trip are items which are covered and all these points can happen before your charter. Without trip insurance you are very vulnerable to loosing your 50% deposit. Take out trip insurance - no matter what! Trip insurance may seem like a waste of money, but when we need it is a wonderful coverage to have. All our competitors say - Oh, if we rebook the same vessel for the same period we will refund you less 20%, but sometimes it is totally impossible to rebook that one week. So it sounds fine but it is not. Take out trip insurance. Barrington-Hall can assist you in securing your trip insurance as well. Weather for Yacht Charters in the Caribbean and Mediterranean. Most of the Caribbean has a 10 month yacht charter season. The difference in water temperature during winter and summer months is negligible. Rain is never a problem in the islands, with most rain falling during winter and comes in squalls. Christmas winds are the only setback that comes to mind for your Caribbean yacht rentals. Christmas winds occur during December and January each year. The gentle trade winds are 8-10 knots every day, but the Christmas winds blow 20-25 knots. The best thing to do for a few hours is to select a good anchorage and relax and snorkel there until the winds subside. Hurricanes: We close bookings August 15 to October 15 each year, with September 12 being the biggest 1 day for hurricanes. Many owners charter through hurricane season; trip insurance is mandatory. However, having a hurricane hit you is almost impossible. How to Book a Private Yacht Charter..
We have access to a lot of vessels not listed here on our website, but we will get the right vessel and crew team for you. We will offer you 3-4 private yachts to select from, but push the one we feel is right for you. Do not go outside the vessels we suggest. If you want others to select from simply ask for more, but keep within the crew and vessels we suggest. Once you have selected your vessel, a hold is placed on your selected yacht for 14 days. This hold automatically falls away after 14 days if no contract and deposit is received by Barrington-Hall private yacht charters. It is not we who drop this hold, but the office of the yacht you select. The terms of the agreement are sent to you for signature, and the deposit is to be paid on your signature. Here is what we do for our guests in that background. The terms and conditions with your signature is sent to the owner or his captain to sign, and we clearly state to them zero deposit is paid to them by Barrington-Hall until they have signed the contract. So we hold back payment to their escrow account until we have a fully executed contract. Paying into their escrow account means the owner cannot touch that money until a few days prior to your private yacht charter. Payment: If your contract is signed more than 6 months out, then a 25% deposit is needed. On the 6 month date, the other 25% is paid, then 45 days prior to boarding your final 50% is due. Payment less than 6 months out means 50% deposit, with the final 50% due 45 days prior to boarding. When guests sign the contract 45 days or less, 100% of the funds are due. Generally, the two forms of payment are a check or wire details. Some owners accept credit cards, and some have the guest pay for the transaction costs. No. These are mostly all-inclusive yacht vacations. Included are all your foods, drinks and use of all equipment while on board. If you have had a good time it is customary to a 15-20% of the charter cost as a gratuity for the crew. The only exceptions are if your cruise involves other countries you will be responsible for any customs and/or immigrations fees. We generally just set anchor but if you request to take a mooring ball for the night or at a marina dock those charges are extra.